Discover your perfect Florida vacation with our top 10 resorts by category. Trips to Florida are almost synonymous with Family Vacations. For years families have packed up the car and made the journey to the southern tip of the US to enjoy the warm weather, beautiful beaches, golf, resorts, theme parks and so much more. Although today when you mention the best Florida family resorts, Disney may be the first thing to come to mind. Although Disney World is a big part of the Florida Vacation experience there is so much more that is worth exploring with your kids. If you are looking for Disney, don’t worry we have included their top resorts as well. Discover the best top 10 family resorts in Florida below and build memories with your children that will last a life time. If you are wanting to get away with out the kids, check out our list of top 10 couples resorts! You can have a luxury vacation with your family! 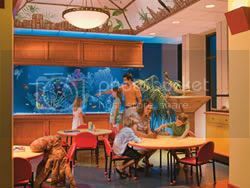 Although many top Florida resorts are geared more towards adults this location welcomes children with open arms. Hawks Cay Resort is a kid friendly luxury facility offering island tranquility in the Florida Keys. With outstanding amenities including five refreshing pools, a salt water lagoon, and a private marina, where sunset sails, charter fishing, and jet ski tours embark, it's easy to see why Hawks Cay is a top rated family resort. Fresh off a $35 million transformation, this Florida Keys Resort destination is ideal for both exhilarating family adventures and romantic interludes alike. 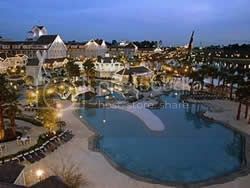 Nobody does family vacations better than Disney, and the list of Top Florida Family Resorts is full of locations offered by them. 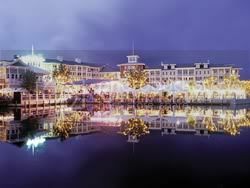 The first is Disney's Beach Club Resort, featuring New England-style architecture accented by large oak trees and the 25-acre Crescent Lake. The lake is the center of lively family activity and is dotted with rented boats and filled with catch and release fish. The true excitement for the kids is the on-site Stormalong Bay, a water wonderland featuring water falls, a lazy river, elevated tanning deck, and a water-slide. So where do the adults relax? Hurricane Hanna's pool side restaurant and grill! Get ready for some family friendly excitement. If you have told your kids you are considering a family vacation to Florida than chances are they have told you about the Nick hotel, officially called Nickelodeon Suites Resorts in Orlando. This resort offers the wildest, wackiest family vacation ever, and it's everything they've imagined and more. There is not another resort like this one. Give your kids a chance to experience the Slime of their life! The high energy resort features wild water park and live Nick entertainment. In the heart of your kids, this is truly the top Florida resort. 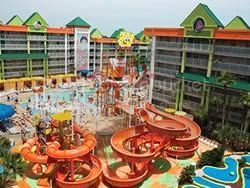 Bring out your inner child and head down to Orlando to experience the Nickelodeon Suites Resort. When you think of The Breakers, kind friendly may not be the first thought that comes to mind. That may be because The Breakers Palm Beach is not only a family friendly resort, it's also a top golf and beach resort. Surprisingly this upscale American legend welcomes kids 17 and under free and offers a 6,000 square foot family center that includes a safe enclosed toddler room, arcade, playroom, art & crafts center, and a x-box gaming room. The Breakers also has an amazing kids program. This top Florida resort may be the most well round vacation destination in the state. Do you need any more reasons to book your stay? Nothing compares to waking up with a giraffe and other exotic animals sitting right outside your resort. Disney's Animal Kingdom Lodge is not only a top Florida resort for families, it is one of the most unique. 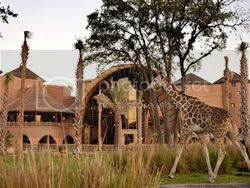 The Disney African lodge-style complex features a 43-acre wildlife preserve and authentic African-inspired architecture. No need to head to Africa to partake in the adventure. After a tranquil morning at the resort, get ready for some fun at the nearby Disney amusement parks.The Animal Kingdom Lodge will assist in providing family vacation memories that will last a life time. The only downside is the kids (and the rest of the family) will never want to visit another resort other than this one! It is possible to have relaxing family vacation, and this top rated Northwest Florida resort makes it ever so easy. The Hilton Sandestin Beach, Golf, and Spa resort offers everyone a chance to unwind and slow down. The resort hotel sits directly on the sugar white sand and emerald green waters unique to this area. The Beachfront Hilton Sandestin also offers a great kids program and a spa. So the wife and children will be excited. Did we mention this is also a top Florida Golf Resort? Everyone in the family will take delight here. Looking for a little excitement? Be sure to make plans to visit Baytowne Wharf, the exciting village center located on the resort that features live events, dining, bars, and attractions for the kids. Escape to this inviting AAA Four Diamond Luxury resort in Orlando. The Hyatt Regency is not new to the Top 10 Florida Resort list. In fact this resort is also featured as a top golf resort, making it the ideal location both the parents and the kids! The entire family will love the exciting half-acre free form pool featuring waterfalls, slides, and a sundeck. This location also features Camp Hyatt Grand Cypress, an exciting children's program that features a variety of activities and events including necklace making, cookie decorating, trail walks, movies, pool time, and much more! The camp offers half day, full day, and evening sessions so squeezing in some golf, tennis or having a nice meal should be no problem at all. Amelia Island is located just north of Jacksonville and is not only a top Florida family resort, it was voted one of the top island destinations in North America. The Villas of Amelia Island Plantation is a AAA four Diamond beach resort and conference center. Offering villa accommodations, this 1,350 acre Florida resort features both family friendly activities and ample meeting facilities. The amenities of the Villas of Amelia Island include three championship golf courses, resort pools, tennis, horseback riding, a fitness center, restaurants and more. This top Northeast Florida resort gives guest a chances to reconnect with both family and friends. Reserve your vacation today and experience the best of Amelia Island. The Grand Floridian is one of the most luxurious resorts on Disney. It is possible to combine luxury and family friendly fun, and nobody does it better than Disney and their Grand Floridian Resort and Spa. Enjoy the stately guest rooms that combine Victorian sophistication and modern comforts. Dine at one of the six on-site restaurants featuring outstanding dishes. You and your children will enjoy personal watercraft rentals, water sports, a 24 hour game room, beach, pools, and multiple programs for kid's off all ages. There is a reason Disney is ranked three times among the top 10 Florida Family Resorts, experience it for yourself and see why! Not all family friendly resort hotels in Florida have to be costly and this location is one to prove it. 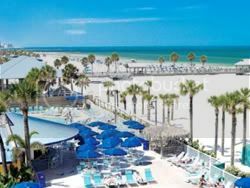 The Hilton Clearwater Beach Resort is recommended by the New Parents Guide as a kid friendly resort that you will absolutely want to consider. The main attraction for kids, other than the beach and the pool, is the Fun Factory program. This supervised kids program features a trained staff that offers numerous indoor and outdoor activities. Looking to spend more time with the family? The resort itself is home to two beach-side pools and includes on-site activities such as wave running, shelling, kayaking, beach volleyball, para sailing and more! Content copyright . Top Florida Resorts. All rights reserved.